"Bad Time To Be Poor"
ZuniorA lot of people were excited when Canadian indie icons Rheostatics announced that they were reuniting for a couple of shows to mark the 65th anniversary of Toronto’s Horseshoe Tavern this week, and then a lot more – particularly those who missed out on tickets for those two shows – got excited when a third show was added to meet demand. Then all of them were disappointed when the shows were abruptly cancelled, presumed due to Martin Tielli’s long-running battle with performance anxiety, and disappointment turned to concern when producer and one-time Rheo (though not involved with this reunion) Michael Philip Wojoweda implied the reasons were somewhat darker than that. I hadn’t planned to attend – best to let those three square feet of Horseshoe floor go to real fans rather than casual observers – but was disappointed because I was pretty keen to post this Rheos cover. 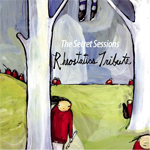 It’s taken from a tribute album assembled by the folks at Zunior called The Secret Sessions, recorded in secret and released as a surprise rhetirement gift to coincide with the Rheostatics final shows in Spring 2007. It finds arguably one of the most Canadian of Canadian indie bands covered by maybe the next-most Canadian of Canadian indie bands, The Weakerthans; certainly they’ve got the most songs about hockey between them. Then I decided, why not post it anyways if just to draw attention to the comp, which at five years old is probably a little under the radar these days. All proceeds from the sale of the tribute go to support the Daily Bread Food Bank, so why not take a bit of that ticket refund and treat yourself to some new takes on old Rheos songs by the likes of Weeping Tile, The Inbreds, Cuff The Duke, and more and support a worthy cause in this giving season. And if you were going to those rheunion shows and now find a hole in your calendar, know that Rheos guitarist Dave Bidini has stepped up with his solo project Bidiniband to perform at The ‘Shoe the night of December 5; it’s a free show that promises lots of guest vocalists and probably no shortage of Rheostatics songs. It starts at 10PM. The Globe & Mail has an article about how musicians – Tielli included – have battled with stage fright, with a sidebar from Jenn Grant about how she came to terms with her own fear of performing. Update: Dave Bidini has offered a couple clarifications on the cancellations: “MT said he cldnt do shows; we didn’t bail on him. and he never had history of perf anxiety with us.” Awkward grammar courtesy of Twitter. @fyang hey frank, nice post. 2 things: MT said he cldnt do shows; we didn’t bail on him. and he never had history of perf anxiety with us.